white pepper | Wheat, Not Oats, Dear. The Bering Strait Bridge! !!!! !!!!!!! ! Oh my HEAVENLY HOST: the sheer, unbridled gloriousness of the Bering Strait Bridge! The Bering Strait Bridge doesn’t currently exist, for the record, but wishers and dreamers the world over have devoted whole swaths of their brain stems to imagining how it could! 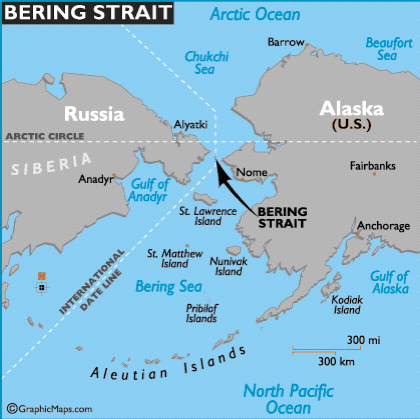 Long story short: the Bridge would connect Cape Dezhnev in Russia [the farthest point east on the Asian continent] and Cape Prince of Wales in Alaska [the farthest point west on the North American continent]. [Alaska really got the short end of the name stick on this one, or “the fuzzy end of the lollipop”, as they say. Which do you think sounds cooler? Dezhnev, right? “Cape Prince of Wales”? Bor-ing!] Quoth my father, if this bridge existed, one could get in one’s car in Paris, and conceivably alight in South America. It would change the world. It would broaden the scope of human experience. Also, it would be totally awesome. You’d also have to get to the Strait to begin with, which means the taking of trains and what-all through the nigh-impassable Canadian-Alaskan-Siberian wild. Last summer, I was introduced to the writer Annie Dillard via her lovely book “The Maytrees”. “More more more,” I said, after reading “The Maytrees”, but more Annie Dillard was not on the horizon for me until I read her beautiful book of essays, “Teaching A Stone to Talk”, some time thereafter. I’m currently reading “Pilgrim at Tinker Creek”, which garnered her the Pulitzer back in the 70s, and it’s k.i.l.l.i.n.g m.e. I’m trying to figure out how I was a whole person before I read Annie Dillard, who once wrote an essay about wanting to become a weasel because they “[live] as they are meant to, yielding at every moment to the perfect freedom of single necessity”. I dunno. “The Pole of Relative Inaccessibility is “that imaginary point on the Arctic Ocean farthest from land in any direction.” It is a navigator’s paper point contrived to console Arctic explorers who, after Peary and Henson reached the North Pole in 1909, had nowhere special to go. There is a Pole of Relative Inaccessibility on the Antarctic continent, also; it is that point of land farthest from salt water in any direction. She makes me want to be good. This morning I decided that I would emulate Annie Dillard, and Observe Nature. I noticed that the precious lilacs outside my building had, almost overnight, faded from their pale purple to an almost-white. I will find out why, and report back. Their delicious scent could still level an ox at thirty paces, though.